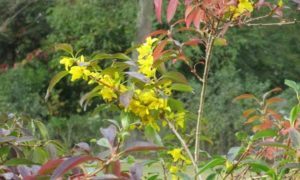 A bit of a strange scene in my backyard: forsythia blooming among the fall foliage changing of colors. 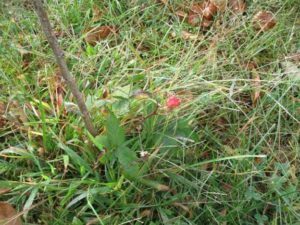 SPRING IN THE FALL: Years ago, I recall seeing sheep laurel, “Kalmia angustifolia,” a spring bloomer, flowering in the fall in the Pine Barrens around Helmetta. Twice this week, I noticed a bird or birds singing away, seemingly a springtime song; And a red-bellied woodpecker, “Melanerpes carolinus,” drummed against my house. 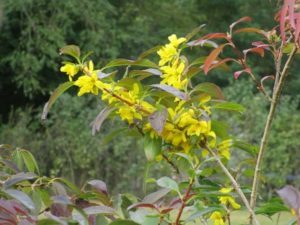 Also, this week, I noticed another spring bloomer in flower – forsythia. It flowered in my backyard. I normally see forsythia blooming for the first time of the season in early March to mid-April. What does it all mean? I just think the fall conditions are replicating spring conditions, especially the summerlike temperatures. The backyard forsythia in bloom. An October 12, Thursday, map from the Fall Foliage Network. 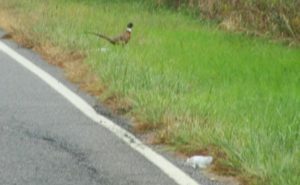 DRIVE-BY NATURALIST, PHEASANT: I just happened to be reading about ring-necked pheasants, “Phasianus colchicus,” the other day. Then, I saw one between the Applegarth and Wyckoff Mills section of Monroe, Middlesex County, the first time I recall seeing one afield in maybe 20 or 25 years. 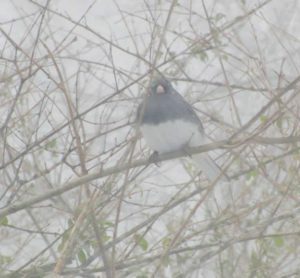 These are non-native – introduced to America from Asia in the 1880s, according to Cornell University’s All About Birds website, allaboutbirds.org. Now, they are naturalized in the United States. This one could have been a naturalized bird or one released for hunting. 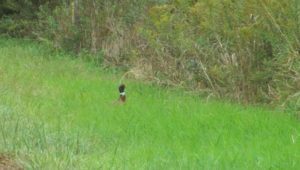 This is a rather blurry photograph, because I came across this ring-necked pheasant unexpectedly while I was driving and had to quickly crank off a photograph before it fled. I am using this photo because it shows a full view of the bird. Also, I did not crop out the roadside litter, to illustrate how wildlife competes with human carelessness. Notice the white, forming the ring around its neck. 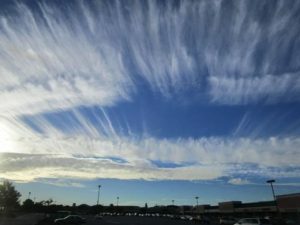 CLOUDS: This week’s spectacular cloud scene was in Middlesex County, at North Brunswick, looking toward Milltown. I stopped at the McDonald’s restaurant for breakfast, looked at the sky, and there they were. Clouds over North Brunswick, Middlesex County. Judy Auer Shaw’s 2014 book. 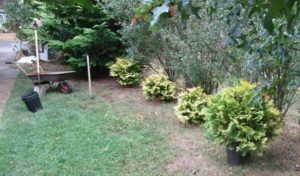 YARD AND GARDEN: I planted five “false cypress,” or Crippsii,” I picked up at Krygier’s Nursery in South Brunswick, Middlesex County. The Knock Out roses and zinnias continue blooming – the zinnias being visited by such butterflies as the painted lady, “Vanessa virginiensis,” and cabbage white, “Pieris rapae.” Despite blooming, the zinnias are losing their luster, covered with powdery mildew, “Golovinomyces cichoracearum,” and a leaf spot disease. I also found my first raspberry on some bushes planted earlier this year. Five “false cypress,” or Crippsii, have been added to my yard. A raspberry fruiting in my backyard garden. FARMING PERILS IN THE MIDLANDS: I was visiting Krygier’s Nursery, owned by husband and wife Jimmy Krygier, in South Brunswick, Middlesex County, and two perils were obvious – encroaching development and damage caused by browsing deer, “Odocoileus virginianus.” The nursery, a Krygier family business for three generations of about 100 years, is on Route 535, also known as Cranbury-South River Road, Cranbury Road, and South River Road. What was adjoining cornfield up to months ago is now a warehouse property, for example. And one only has to see how the deer have shaped the arbor vitae trees through their browsing. 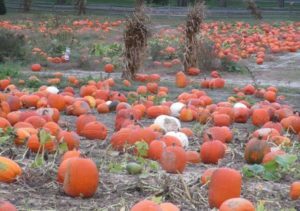 (Krygier’s Nursery is at the corner of Route 535 and Dunham’s Corner Road, South Brunswick, near the Middlesex County Fair Grounds). Development encroaches Krygier’s Nursery in South Brunswick, Middlesex County. Notice the odd shape to the arbor vitae. It is caused by deer nibbling on the trees. DEER DOCUMENTARY: “The Deer Stand” is a documentary about deer over-population in the Jersey Midlands. See the movie at https://vimeo.com/233572156. 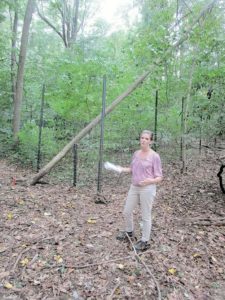 In fall of 2016, Anna Luiten, an ecologist with the Monmouth County Park System, stands in a Thompson Park forest area over-browsed by deer. The fenced area contains a lush understory, because it is protected from deer. A “snowbird” in the snow in my yard in early 2017. OCEAN TEMPERATURES: Atlantic Ocean temperatures on the New Jersey coast were about 67 degrees to 69 degrees during the October 14-15 weekend. SUNRISE/SUNSET: For October 15, Sunday, to October 21, Saturday, the sun will rise from about 7:10 to 7:15 a.m. and set about 6:10 to 6:15 p.m. For October 22, Sunday, to October 28, Saturday, the sun will rise about 7:20 a.m. and set about 6 a.m. to 6:05 a.m. We switch to Daylight Savings Time November 5, Sunday, at 2 a.m., the clocks moving back to 1 a.m. THE NIGHT SKY: The next full moon is the Frost Moon on the November 3-4 overnight. 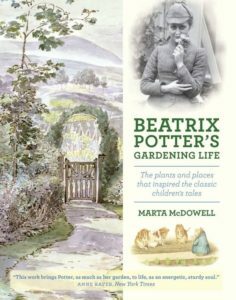 UPCOMING: 2017, October 28, Saturday, 1 p.m. book signing and 2 p.m. lecture with Marta McDowell, author of “Beatrix Potter’s Gardening Life,” at Jamesburg Presbyterian Church, 175 Gatzmer Ave, Jamesburg. $30 at the door. 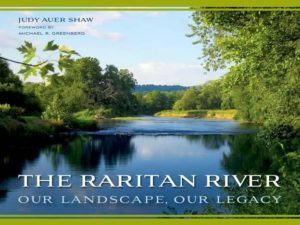 More information is available from the Earth Center Conservancy (of Middlesex County), www.ecc-nj.com. Beatrix Potter, born in 1866 and died in 1943, was a children’s writer and illustrator. She wrote and illustrated “The Tale of Peter Rabbit,” 1901. Author Marta McDowell will sign books and speak in Jamesburg, Middlesex County, October 28, Saturday. 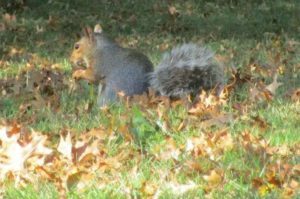 Gray squirrels, “Sciurus carolinensis,” appear to be active, burying acorns, preparing for winter. This one was at Rutgers University’s College Avenue Campus in New Brunswick, Middlesex County. Joe Sapia, 60, is a lifelong Monroe resident. 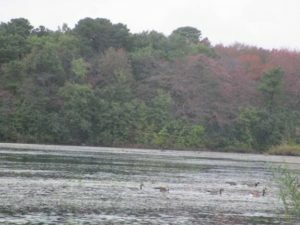 He is a Pine Barrens naturalist and an organic vegetable-fruit gardener. He gardens the same backyard plot as did his Italian-American father, Joe Sr., and his Polish-immigrant, maternal grandmother, Annie Poznanski Onda. Both are inspirations for his food gardening. He draws inspiration on the Pine Barrens around Helmetta from his mother, Sophie Onda Sapia, who lived her whole life in these Pines, and his Grandma Annie. Joe’s work also is at @JosephSapia on Twitter.com, along with Facebook.com on the Jersey Midlands page.